Pet Battles have been live since yesterday and they are pretty addictive even when full of bugs. Yes, we’ve had pets starting battles with zero health (and still do intermittently), we’ve been flagged for PvP after pet battles (Yes I’m on a PvE server. It has something to do with the way cross realm zones are set up in beta). Even so, I must have them all! So here are a few tips to get you started. 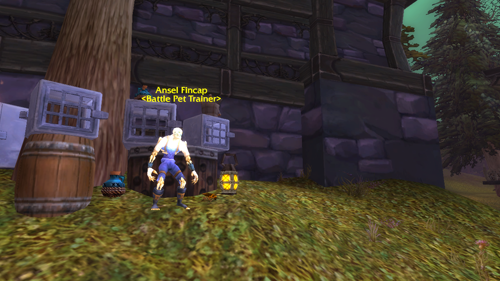 You can pick up Pet Training ability at level 5 for 100 gold. It’s account wide so you only have to pay on one character. On the first few days of the expansion do yourself a favor and pick a pet trainer far away from your capitol city. Competition for level 1 pets is fierce so the farther away you are the easier it will be on you. Varzok, Orgrimmar near flight path. Matty, Orgrimmar in the Goblin Slums. While you’re there your trainer can sell you a Jade Crane Chick to get you started. It looks just like a regular green crane only smaller. UPDATE (7/16/12): The trainers had a different pet today. I wonder if they will continue to sell a different one each day. So far I’ve seen three different pets for sale. Black Kingsnake, Jade Crane Chick, and the Golden Dragonhawk Hatchling. I’ll check again tomorrow. UPDATE to the UPDATE: According to this post on WarcraftPets.com they will only sell you the pet that is assigned to your race. Since I was logged in on different toons (each was a different race) I got a different pet. Still, if you play a lot of different races that’s a good way to pick up some new pets. Once you have trained your trainer will give you a quest. In fact there’s a whole long series of quests that help you level up your pets. Get the nearby stable-master to heal your pets. Level one of your pets to level 3. At level 3 you get the ability to capture pets. Catch a wild battle pet. At this point go to the main pet trainer in your capitol city. For the Horde that is Varzok near the flight master in Orgrimmar. He’ll get you started on the next series of quests. All of the following quests send you out to pet tamers out in the world. You challenge them and ultimately defeat them. Zabba Zabba, The Pet Tamer (Just south of Orgrimmar). Dagra the Fierce (On a hill near the Crossroads). Analynn (West side of Ashenvale). Zonya the Sadist (Stonetalon Mtns. Currently this quest is bugged and will not give you credit for completion). I was once an adventurer like you, till I took a rocket to the knee! Blizzard promises that the quest line will continue. But for now that’s as far as you can go. If you’re going to queue for a PvP pet battle, don’t do it in Orgrimmar. 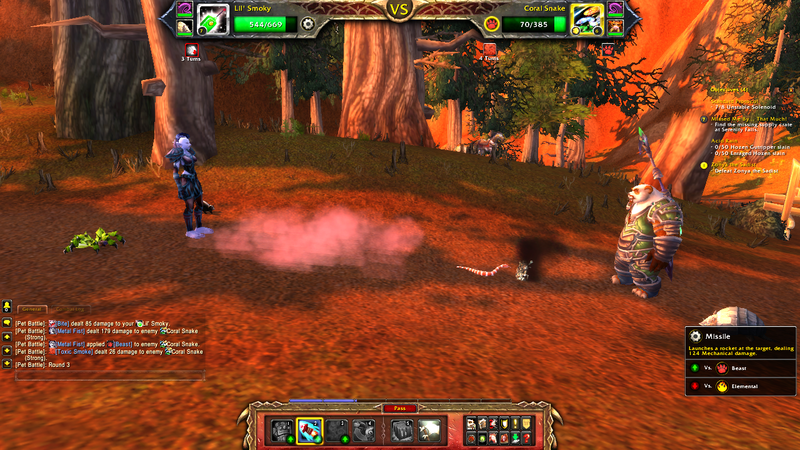 Right now there is a whole in the ground where the pet battle takes place that you will fall through and die. Fortunately Blizzard fixed it so that you can complete the pet battle while dead. Originally your pet battle aborted upon your death. It does seem a little strange to be battling while dead though. You can do the introductory quests on each of your toons either with the same pets or brand new ones. That’s a really good way to get a bunch of newer pets up in level. I’m not sure if that is intended. So take that with a grain of salt. It may change. As could all of this. I was wondering about the green crane. It was already in book when I logged after the implementation. But when I died after queuing for the Pet Battle that was very odd. Hmmm. Today the pet battle trainers had a different pet for sale. A Golden Dragonhawk Hatchling. I wonder if they have a different pet each day. Ok, figured it out. It goes by your character’s race. And since I was logged in on different toons each time I got a different pet. See the following post on Warcraftpets.com.